lthough veteran research scientist at Montana State University, Dr. Keith Cooksey, describes himself modestly as a biochemist that works with microorganisms, his algal biofuel-driven discoveries from the ’80s and ’90s are still considered state of the art, and continue to influence the work of phycologists today. In fact, his latest breakthrough, which currently is causing a stir in the industry, dates back over 20 years since the idea was first presented. It all started back in England in the late 1950s. With a fresh Ph.D. from the British School of Malting and Brewing and Applied Biochemistry, Keith started researching brewery contamination organisms, looking at their biochemistry to try and understand how they did what they did—which was: turned alcohol into acetic acid. “That’s called vinegar and it doesn’t make for a good selling beer,” he points out. After research positions at the National Research Council, in Ottawa, Ontario, UC San Francisco’s Department of Biochemistry, and the Department of Bacteriology at Berkeley, Keith and his wife Barbara moved back in England, where they both joined Shell Research to work on biological pesticides. After about three years at Shell, Keith got a surprising offer from the University of Miami Marine Lab in Florida, where he had been recommended for an assignment as a marine biochemist to study diatoms. 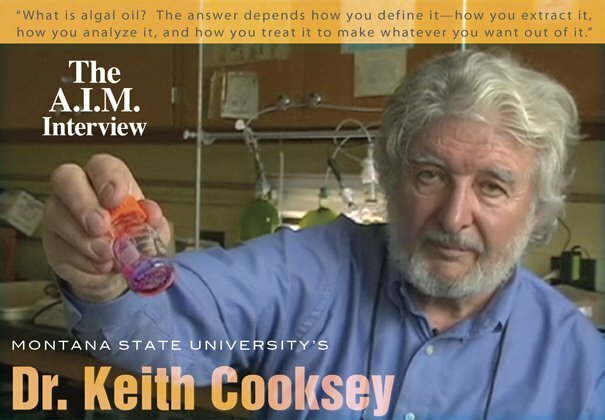 We spoke with Dr. Cooksey recently at the Algae World Summit, in San Diego, to find out more about his illustrious algal career, and his surprising comeback technology that now seems to be all the rage. So you moved from England to Miami in 1968 to study algae? I was doing very well with biological pesticides, but my wife wanted to go back to California, and it seemed as though if we went to Florida we’d be half way there. So I took the job in Miami and was asked to work on marine diatoms. The job was to understand how marine diatoms make a living, other than by photosynthesis. I was looking at heterotrophic growth and the biochemistry and enzyme content of marine diatoms that we had isolated. Back then nobody was doing anything like that. Were you writing grant proposals for this research? It was difficult to get funded to do the kind of stuff I wanted to do, but then one day someone in the medical school said that they had money to work for the Navy (US Office of Naval Research) on how ships get fouled with diatoms. They had no idea how to deal with diatoms. So I said, “Well, I do. I’m growing them all the time.” So, for 30 years, the Office of Naval Research supported what we did, and we made a lot of breakthroughs in diatom cell biology, especially the involvement of calcium ions in the cellular attachment mechanism. 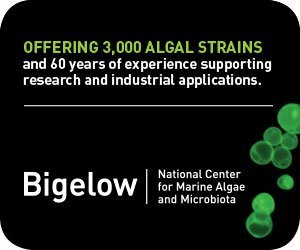 You worked on the team for the DOE/SERI-funded Aquatic Species Program in the Eighties, the first government-sponsored high-level research project exploring algae as a potential biofuel. How did that come about? The Miami job ended and we moved to Montana State University. While there, the Office of Naval Research asked me if I would go to Europe for two years, on kind of a quasi-diplomatic mission, and let them know what the Europeans and the Brits were doing in the field of molecular biology, as it applied to the ocean. He said, “Send me a proposal.” So I sent a proposal, It was successful and we entered the field of algal biofuels. We put a post doc and a graduate student on the project, and published three of what turned out to be, if I say so myself, quite important papers from that ASP work. You developed a technique about that time that has become a standard procedure in phycology, i.e. using Nile Red stain to identify lipid content in algal cells. How did that come about? There are 71 references in the ASP’s Closeout Document to Nile Red. There was even discussion today at this conference on how valid a Nile Red determination is. It was very difficult back then to find a place to buy Nile Red, but we managed to get some from Kodak. So I stained some cells, and I actually said “Eureka!” When I first saw it fluoresce, it was absolutely spectacular! So, Nile Red wasn’t my idea, though I’m credited with it. It was my wife’s. And we actually got it from somewhere else. But that’s science—using one person’s knowledge to forward the field in another area. Actually, about three years ago I got a call from Dr. Greenspan, the author of that “starvation paper.” He said he was writing to thank me for making him famous, because he’d never had a paper quoted so much, and that it was only quoted because I utilized his technique. The field has changed quite a bit since then. Is Nile Red still the standard? What alerted me to the fact that there was a biofuel movement taking place was that, in 2005 or 2006, I started getting a call about every other day asking for a reprint of the paper which I published in 1987. What the hell, I thought. This is old stuff. Even someone from NREL came by about then and said that it was becoming the state of the art method for determining lipid content of algae. The problem was that people were literally taking the method and using it exactly as I’d done it. But it’s organism specific. The concentration of dye that you use needs to be tailored to your organism. The length of time it takes for the dye to get in to the cell depends on how hydrophobic the lipid droplets are, their size, and how long the diffusion path is. That determines the amount of fluorescence and the wavelength of that fluorescence. It works best when the cell’s lipid is mostly neutral triacylglycerol lipid, because that’s what it stains. What else have you found out about extracting algal oil? We found that algal oil depends on how you extract it, and how you measure it. That is still a quite heated topic of discussion. One of the things that I’ve done recently is write an article for the ABO’s Descriptive Language Standards document for algal biofuels. I’m co-chair of that committee with Jim Sears, of A2BE Carbon Capture, as chair. It’s basically about, “What is algal oil?” And the answer depends how you define it, how you extract it, how you analyze it, and how you treat it to make whatever you want out of it. 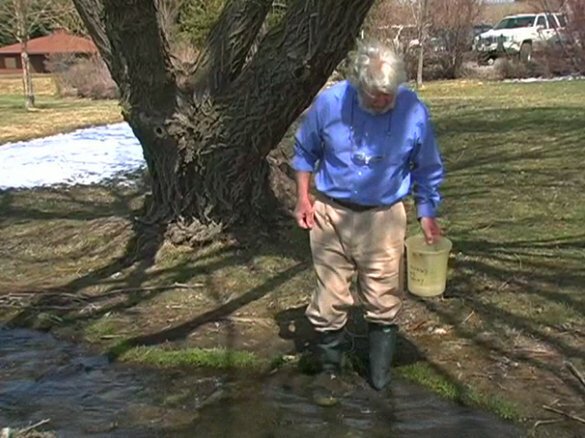 Keith collecting algae samples on the campus of Montana State U. You see this all the time in the literature…an organism’s name and, next to it, its percentage of oil. Well, usually you have no idea what that means. It’s totally ambiguous. You need to see how it was extracted, how you determined what you obtained, and how you converted it to whatever you wanted. If you don’t state all that, reporting only the percentage dry weight of algal oil is meaningless. If you look at the published literature, this is one of the reasons you’ll see numbers that are all over the place, even for one species. Well, since the cell makes triacylglycerol as a reserve material, normally it will not make 80-90% of its dry weight as oil. It could never use it, and it’s under cellular regulatory control. No organism is going to do that. Yet you see these kinds of numbers. 80% oil is a quite common figure. In well defined analysis systems, for instance using biodiesel columns where you do not have to chemically-modify oils, we can look at the triacylglycerol directly with high temperature gas chromatography. Usually we get about 20-25% oil/dry weight. I think that’s probably the “real” number. So how accurate is the Nile Red staining procedure? There was a lot of discussion about whether it was a quantitative method. It’s actually semi-quantitative. It’s not possible really to have a standard lipid and stain it and put it in a fluorometer, obtain a reading, and then relate that back to a standard curve. That works to some extent, but the problem is you have to have suspension of triacylglycerol in an aqueous system to use as a standard. Well, you can make a nice suspension very easily by sonicating the whole system, but that just gives you very small globules that stain nicely. The trouble is, they coalesce and are thus not stable. So, it’s not really a quantitative measurement, but you can look down the microscope with a trained eye and maybe see that one population of cells appears twice as fluorescent as another. Knowing this allows you to relate something you’ve done to the culture in between times that increased the fluorescence. Then, you can do a confirmation experiment where you extract the cells and see by gas chromatography really what you did to their triacylglyceride content. So, you can do the analysis and see whether you’ve been successful or unsuccessful in doing what you did to the algal cell to change its lipid content, in as little as a few seconds, although it could take up to an hour. Most recently you’ve come back to prominence by using baking soda to stimulate lipid accumulation in algae. What’s the story with this? The talk I gave today showed that some of our old work seems to be very relevant to this industry today. 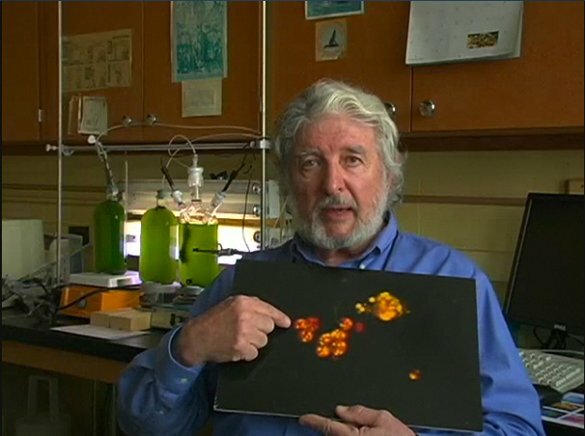 Back in 1990 when my post doc, Jim Guckert, and I were growing algae—measuring the lipid with Nile Red and gas chromatography – Jim came to me one day and said our cells look terrible. They’ve all gone yellow. But, then he said they were full of lipid. I said let’s see what’s wrong, and he said let’s check the pH. It was at 11. I asked him what the buffer was in the medium? We looked at the recipe and saw there wasn’t one—often the case with algal media. So we took an organic buffer at pH-7and put it in, watched the cells turn a beautiful dark green, and look really healthy. But now they didn’t have a scrap of lipid in them. 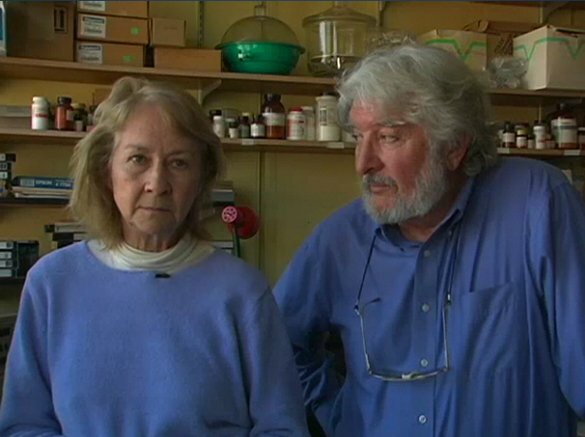 Keith with his wife and lab partner, Barbara Wittlesworth Cooksey. Were you looking to maximize lipid accumulation in these experiments? Yes, we were. And unintentionally we certainly shut it down completely! So that was a light bulb going off. We thought maybe they have to go to a high pH to get the lipid to accumulate. We made the connection but we didn’t know what pH had to do with lipid accumulation. We thought it over some more…we’d added a buffer, pH-7, no lipid. So we had to do the other experiment, without a buffer—and there was the lipid again. So then we said how about if we buffer the system at a high pH? We’d just been using air as a source of CO2, but then we thought that maybe we didn’t have enough carbon, and maybe we could get more lipid if we added more carbon. But bubbling was out of the question for us—the plumbing would be a nightmare, and it all would have to be done aseptically. So I said let’s add sodium bicarbonate. At that pH it has to be a source of carbon. Well, it didn’t make the cells grow any better, and in fact they grew to the same cell density as before, and then just stopped growing. But they didn’t stop making lipid. Now my colleagues and I have tested four organisms with nearly identical results. So we have started looking for the reasons. And we’re still looking for the reasons why sodium bicarbonate stimulates the production of triacylglycerol. But I think I have an answer, or at least somewhere to start. We already know that if you don’t shut off the cell cycle, you don’t get any accumulation, because although the cells keep making lipid, they continue to use it. So you have to bring them to a point where they’re not going to divide, which is what we do with sodium bicarbonate. Then they’re just going to sit there and make neutral lipid as a storage molecule, because they can’t turn off the light. Neither can they turn off the photosynthetic carbon fixation system, but as they can’t make protein because there’s no nitrogen, neither can they grow, i.e., make new cells. Do you feel that sodium bicarbonate is a realistic input at scale? Yeah. The reason being that by adding it at the right time we can halve the time to the maximum lipid yield. If we add bicarbonate at about 7 days, which is when Guckert did it, we get the same amount of lipid in about another day, or day and a half, than we’d obtain if we waited another week or so without adding it. My engineering colleagues wanted to patent this idea, and basically I just went along with the proposal. Actually it’s been very inhibitory to collaborative efforts with other folks in the biofuel field, because if I want to give details to anybody of exactly when you must add the bicarbonate, the university wants a non-disclosure agreement from them in order to receive that information. 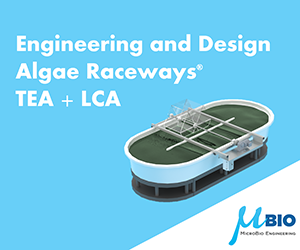 Considering your extensive experience in the development of algal fuel understanding, what is your view of where this industry is and where it’s going? I see a whole different direction happening at this meeting (Algae World Summit III). 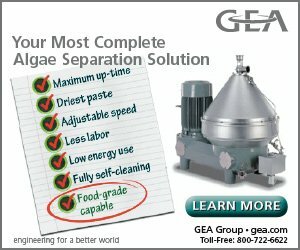 In the past, everybody I’ve talked to at these types of events has said something like, “When we make biofuels we really ought to try and get some other high-value products out of it.” At this meeting, biofuel seems now to be the secondary product, and the primary product could be as simple as organic fertilizer—which sells for more money than oil. There are a lot of other things that are more valuable, like fish food. I’m not surprised, as we have heard here, that feeding marine food organisms marine algal powder makes the fish taste better, look better, and be more healthy than feeding them ground up fish. After all, ground up fish is not their natural diet. I think that we are going to move towards biofuels, but that’s not the only prize we’ve got our eye on anymore. There are multiple prizes. For a long time I’ve thought that by the time this industry is really working, algal oil will be too valuable to burn. Any molecule that consists of long chains of carbon atoms, and is similar to a hydrocarbon, we won’t be burning anymore. When we run out of oil, it’s not just the fuel that will be gone, but the entire petrochemical industry will also have to be replaced or we’ll be living in a world without plastics. Now, we’re not going to run out of oil next week. I don’t know if we’re going to run out of it in 10 years, or even 50 years. But eventually one day we will run out of oil and we’ll be looking at an entirely new world, particularly in the United States, which is completely dependent on the car culture. There is no choice. We are going to have to change our lifestyle. Hopefully it won’t come overnight. Copyright ©2010-2011 AlgaeIndustryMagazine.com. All rights reserved. Permission granted to reprint this article in its entirety. Must include copyright statement and live hyperlinks. Contact editorial@algaeindustrymagazine.com. A.I.M. accepts unsolicited manuscripts for consideration, and takes no responsibility for the validity of claims made in submitted editorial. Sign up to receive breaking A.I.M. updates!